The Monthly Theme for March 1 is “Ageing”. This theme has been suggested by Julie from "Sydney Eye", who is attracted to all things past their prime, for obvious reasons. The "eye" lingers over rust, and mould, and decay, as lovingly as the eye of a mother lingers over the form of her new-born. Julie's fascination with ageing over-flows into a fondness for aged places, and things. She keeps her eye firmly trained upon the past, and admits to tut-tutting the old adage "Those who forget the past, are condemned to repeat it." Many a time has a simple photograph of a building, or an intersection, or a wrought-iron gate, morphed into a full historical paean to a long-forgotten cranny deep within the heart of colonial Sydney-town. Not one for glamour and glitter, for bright lights, or shining stars, Julie is fascinated by hands gnarled by hard, physical work, like that of a gardener. 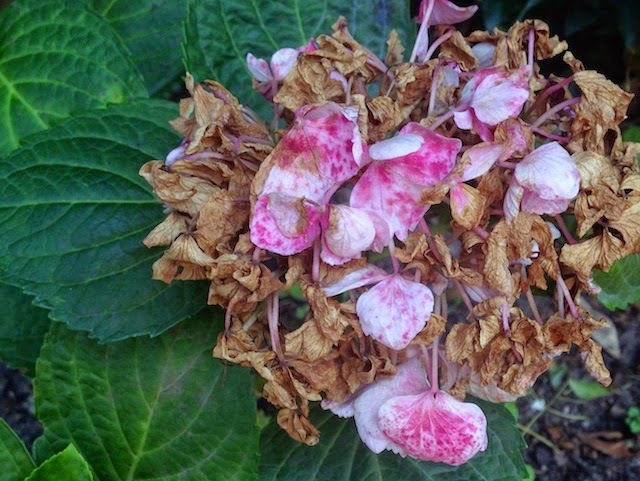 With that in mind, she shares with us this image of a blowsy Hydrangea head, the "Norma Desmond" of her garden bed running down the side path. Folks, please remember to hit the FB "Like", either down below here, or on the Home page of this portal. This will help us to advertise our group, and bring in more members. Don't you think it'd be better forming and promoting s Google Plus group, as Blogspot/Blogger is in fact a Google product and all members and contributors therefore automatically have a G+ profile? It's also a great platform. Most older bloggers do not like Google+ and avoid it like the plague - not time in a brief comment to go into details. I do not have a personal take on this, Stuart. However, we have been going on FB for a while now, and I do not think our members are more likely to participate if we switch to Google+. We do have issues with FB (some of us do), however, I am sure there are problems with Google+, too. I can see that you are into it extensively, with 3,721 followers. apparently 1093 people have me in their Google+ circles WTF? - a lot of them seem to have Russian name - I get half a dozen notifications a day from G+ of folk who are supposedly following me - there aren't enough hours in the day to engage with any of them! Actually G+ is the best place on the web for muting and blocking people. It's pretty common knowledge among people who use a few different soc. networks. I just thought it logical, Julie, as it would negate the need for two separate profiles and log-ins. Inclusion in Google search results would mean that reach would actually be much wider. I somehow erred while cropping the photo and it is a blur on the portal. How can I edit and correct that with the right image? Linky doesn't seem to allow me to do that. Thanks! Kate I'm not saying you can't edit it but I can't see any harm in reposting the link. Actually, the way around this is for Peter Hyndman to delete the error and for Kate (or Peter) to relink. The only linky editing can be done by Peter. Kate, As Julie says you can't edit it, but I'll get onto it! Kate, I used the other image and a different crop, I hope that's OK? It seems to work better on the thumbnail. Stuart, at the moment we have a strong base on Facebook, and very few on G+. Once I get my head around a few other things I'll review our presence there again, but for now we are already spread pretty thin! Made it just in time. With a fibre cut in the router connection, and hours of waiting, I thought I'd never make it. oh no don't switch to Google Plus. I joined and it is a maze in there. I was ready to post my blog today and I see it is closed. It is 11 . 15 A.M here. having weekend and I am off then most times. Good take . How many of us have those right?